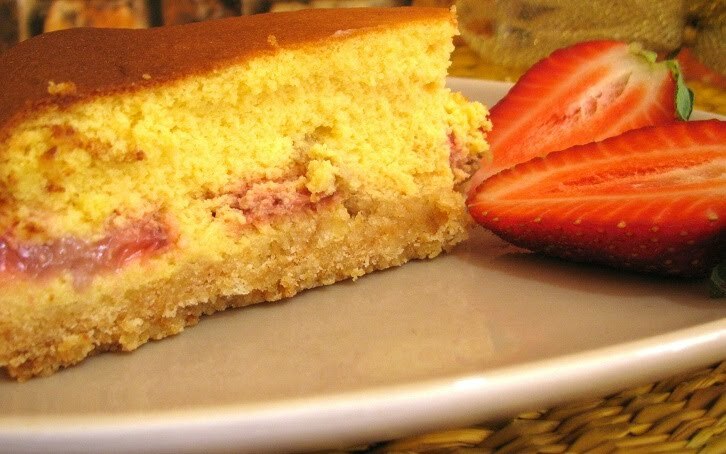 The cheese cake with strawberries is a sweet, delicious and fresh spring. Prepared the night before is great! Ingredients - 250 grams of biscuits - 100 grams of melted butter - 200 g cheese basket - 200 grams of Philadelphia - 200 grams of cream already sweetened - 50 g sugar - 300 grams of strawberries - 15 g gelatin sheets PREPARATION In a bowl full of cold water, add the gelatine to soak for 15 minutes. Meanwhile, prepare the base of the cheese cake: cookies in a food processor chop and mix with the butter until the mixture is homogeneous. Pour into a springform pan with a diameter of 24 cm and then rest for 30 minutes in the refrigerator for you to compact. Clean and wash the strawberries, then Frullani half. Whip the cream. In a bowl, working with the Philadelphia cheese and sugar, combine the strawberries and gelatin. Mix well. Add whipped cream and strawberries were cut into pieces, leaving some aside for the final decoration. Pour the cream on the basis of biscuits and Put back in refrigerator for at least 4 hours before serving. Decorate as desired and serve!